It would appear that despite my reduced posting, my blog is regularly viewed and commented on. I'm hoping that my blogging will be more regular in the coming year. I'm anticipating reaching 2 major milestones by summer - 500 followers and 250k page views. I did manage to get a few more games in this year, but not as many as I'd hoped to. My plan for 2014 is to get at least one gaming session a week in. I'm also going to game for fun and not take part in tournaments this year (apart from our club's FoG:R tourney - I expect to just play 3 games in that as my group contains 2 very good players who will almost certainly trounce me). I would like to get more SciFi gaming in this year, particularly of Full Thrust now that I have some fleets painted up. I also intend to get more games of FoG:R in once my Pirates Buccaneers are painted up. * I've scored a couple of large figures as being equivalent to 3 ordinary 28mm foot each. In addition to these I have painted 2 intro fleets from GZG each of 2 frigates, 2 destroyers, 2 light cruisers, 1 heavy cruiser and 1 battle cruiser. 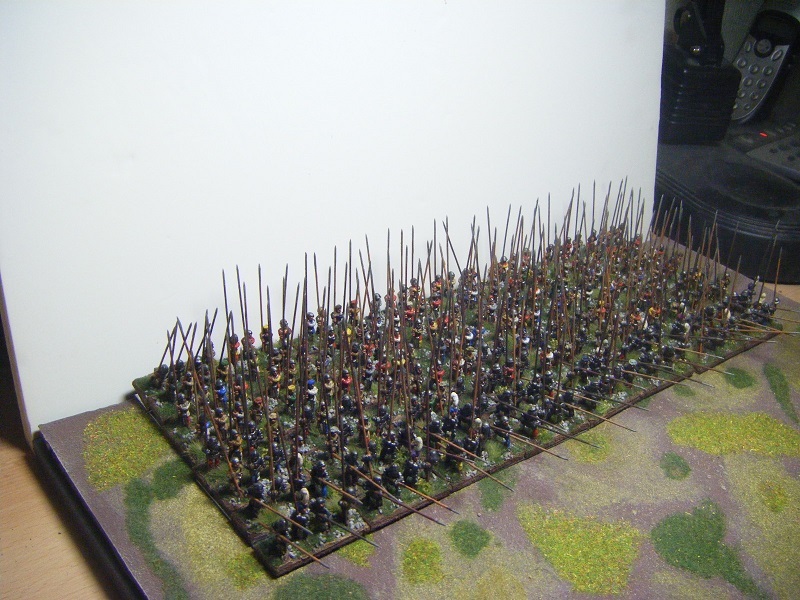 My plan for 2014 is to concentrate on finishing existing armies and getting through my pile of unpainted lead. I particularly want to get a bunch of my 15mm SF figures painted as well as my two large space fleets - the NSL are primed for painting, but I've still got my Japanese to prep and prime. I'll almost certainly add a couple of extra fleets at some point (after all, I do have a 20% discount voucher to use by the end of February). Of course, this means that I will need to resist the temptation to buy minis and start new projects this year. Yeah, right - we all know that won't last beyond 15 minutes of me arriving at Salute! The Koreans will be finished before midnight, even if I have to use my superpowers to halt time. With a bit of luck they will be completed and submitted tonight which will give me a welcome boost to my points. After these I think I will need to make a start on my Coureurs de Bois for the BfC project. The berserkers will go on hold for a while and will be painted up alongside my Viking warlord for the Hero/Heroic Group bonus theme. I'm still debating my entry for the vehicle bonus theme. Painting the whole of my NSL fleet is out of the question, but a small task group should be manageable - perhaps a capital ship and its escorts? Happy New Year everyone and may 2014 be a good one for you all! I've had a fairly productive day. After doing one more step on the Koreans last night, I decided to do some work on my "Villain" bonus theme entry. I opted to carry on with that today and finished painting it, did the varnishing, took photos, had a play with one of them using an online editor, then sent my entry off to Curt - I'd written most of the blurb earlier in the afternoon. Unfortunately you'll have to wait for pics as Curt won't be posting the theme until Sunday. I'll just say that the villain and his villainy are well known to my followers. Wednesday will be my second Blogday, so there will be a prize draw. There may be a slight delay though as I need to sort out what the prize(s?) will be. This evening I will be returning to work on the Koreans. The steps I did yesterday were quite fiddly and time consuming - the rest should be much less onerous. Meanwhile, I need to work out what my next Challenge project will be and what to paint for the next bonus round (vehicle) - maybe some of my NSL fleet? Sorry for the lack of photos today, but they are reserved until Curt has posted them. I didn't get much work done on the Koreans today, so it will be a push to get them finished before the end of 2013. If I focus solely on them tomorrow and Tuesday I might just get them done in time. The reason for not doing much on them is that I made a start on my villain bonus theme entry. The figure on its own would have looked good, but I decided that what I really needed was a backdrop for the photos. So I made a start on that and have almost finished - just need to apply a second layer of paint on one item. They've been up on Curt's blog for a few days, so I'm definitely clear to post them here. My third entry for this year's Challenge was a bunch of 72 Swiss halberdiers. The figures are 15mm from Donnington Miniatures and were (as with all my previous Swiss) painted to represent proportionally all the cantons present at Morat. This batch took me just about 2 days to paint and base. These halberdiers complete my Swiss army for now. At some point I may decide to add a few more bases of them, particularly if I decide that I want to go for early Swiss (else my army would be rather small!). I have done a bit more work on my next 15mm project. As nobody has commented, I might as well tell you what they are - 18 Korean crossbowmen and 80 Korean arquebusiers. If all goes to plan, I should be able to finish these on Monday and submit them in time to go up before the end of 2013. I've also begun work on my entry for the Villain bonus theme. The parts have been washed and I've started assembling it. I need to do a little bit of Milliput work to add some extra touches to the figure. Hi folks - I'm back from the wilds of Sussex. Christmas Eve - My journey down was a mild headache rather than a nightmare. The only lines open on Southern rail were to Uckfield and East Grinstead (phew - that's the one I wanted). Unfortunately this meant that passengers for Gatwick, Brighton, Eastbourne and other coastal towns were all being sent to East Grinstead where they would then get onto coaches for the rest of their journey. This meant that the train was packed out, even with the extra coaches that had been added. When we got to Oxted, our train was held there for about twenty minutes as East Grinstead was dangerously overcrowded. On our arrival it was still overcrowded and it took my dad about 20 minutes to locate me in the crowd. It might have been quicker if he'd bothered to tell me he had a new car as I had been looking out for his old one. we decided to chow down on fish and chips rather than cook. Jolly good it was too. Afterwards we settled down to watch TV after putting up some decorations in the living room and hallway (my dad never does anything before I get there). Christmas Day - after a delicious breakfast of poached smoked haddock with poached eggs, followed by toast and marmelade all washed down with fortified (whisky) coffee, it was time to watch a Carry On movie while we waited for my sister to collect us. Lunch was the usual fare - turkey, pigs in blankets, roast spuds and parsnips, carrots, Brussels, bread sauce, cranberry sauce, sage & onion stuffing, chestnut stuffing and Tamsin's Extra Special Xmas Gravy (2013 variant) preceded by copious quantities of champers. My sister and brother in law were on Chablis, the rest of us were on Chateau Neuf de Pape "Croix de Pape" which I'd bought - very nice indeed. Xmas pud with brandy butter was followed by the Her Majesty then it was a delicious fruit salad. We then relaxed for an hour whilst waiting for the cab home. I did take the opportunity to check in on the Challenge at this point and was pleased to see my Swiss halberdiers were up and receiving lovely comments. Dr Who was, inevitably, watched in the evening. Although the visuals were as always great, I was rather disappointed with the story, much as I was with Day of the Doctor. Boxing Day - after a lie in, late breakfast was a fry up. We mostly watched TV during the day whilst snacking on crisps with dips and drinking bucks fizz. We had a lovely roast gammon joint in the evening followed by some rather scrummy crusted port (we were forced to strain and decant it as the cork had crumbled in the neck of the bottle). Today - as my sister had phoned to say that the station at East Grinstead was chaos again, we decided that the best plan of action was for me to get my return train from Lingfield to avoid the crowds. Smart move - the train was relatively empty and I got home in good time. Since getting home I have spent several hours catching up on blogs and TMP. I've also made a start on my next 15mm painting project for the Challenge. I'll be doing this alongside the Berserkers. Or the other way round, depending on how I feel. You can probably work out what the 15mm figures are. Challenge Day 10 - Merry Xmas folks! Today will be my last post for a few days as I'm heading off to Sussex for Christmas with my family. My departure is a little delayed - it appears that the storm last night blocked some tracks and earlier trains were cancelled. I'm hoping that when I get to Victoria they are running again. I did complete the basing of these last night and sent the photos to Curt. Unfortunately, I suspect that I missed the cut-off time so they won't be posted until I'm away from computer access. I will respond to any comments when I get back to London on Friday or Saturday. Until then, I wish you and your families a very wonderful Christmas and hope that Santa delivers all the lead, plastic and resin you asked him for. Yesterday Curt posted a mammoth gallery page of all the entries for the first fortnightly bonus theme. There were forty of the Challengers who had made submissions. Every entry was very different and all were wonderful to see. My entry was a medieval picnic scene which will be the camp for my Swiss army. This netted me 16 points for the scene plus the 50 theme bonus points, taking my total to 114 and putting me in 12th place. As Seb correctly guessed yesterday, the project I'm working on for a rapid pre-Christmas submission is my Swiss halberdiers. I did manage to finish painting them last night, but too late to base them as well. I finished basing them a few minutes ago and I'm just waiting for the basing gunk to dry. This evening I should be able to complete the basing. These will give me a very welcome boost to my points total as I take a break from painting for a few days. As they've been up on Curt's blog for over 24 hours now, I can post them here. This was my first entry in this year's Challenge and netted me 48 points. I should more than double my score today when the non-combatant bonus theme entries are posted. So, the Seleucid xystophoroi cavalry. The figures are from Donnington Miniatures - 11 are companion/agema cavalry with one cataphract as a leader. I went a bit further than usual with these and did more than one layer on the armour and cloaks. Looking at the pictures now, I realise that I missed a step - there are no white markings on any of the horses' legs! Oh well. I decided to keep the basing fairly plain, but might add tufts in the future if I can find some that would look right. Glamour shot with the nellies! I'm quite pleased with these boys and hope you all like the look of them. I was feeling pretty wrecked yesterday after doing a shop to stock up on food for the holiday, so I halted work on the berserkers as I didn't feel up to doing detail work. Instead I started work on another of my challenge projects, doing black and yellow ochre undercoats on a bunch of 15mm figures. This morning I drybrushed over the black with oily steel.That might give some of you a hint of what the project is if you remember my entries last year. I might even be able to get them pretty much finished today (apart from flocking, tufting etc) so there is a chance that I will be able to add a goodly quantity of points to my total before Christmas. As I'll be heading down to my family in Sussex for a few days and won't be able to take any painting with me, that would be quite handy. Today was the last day at work before Christmas. Knowing that most people would be off (so I'd have less work to do than normal, but still needed to be there until late afternoon, just in case) I decided to take the berserkers in with me, to take advantage of the quiet and get a start on painting them. I'm quite pleased with the results so far - flesh is done to 3 layers and the wolfskins have received their basecoats followed by a wash of black-brown. I also basecoated the shafts of the spear and axes. The wolfskin basecoats were done by mixing different browns with light grey. Tomorrow I'll be highlighting them with various weights of drybrushing and hopefully getting the rest of the details done. On the way home I picked up a parcel from the local Royal Mail depot. It was an order I'd placed with EM4 Miniatures. I'd ordered a bunch of skull & crossbones dice to use when fielding my pirate army (once it's painted, of course - hopefully it will be completed by the end of the Challenge), some improved dice for use with the Ludus Gladiatorus game, and a couple of EM4's Kolinsky sable brushes to try as an alternative to the W&N Series 7 brushes I currently use but which are a pain in the neck to get replacements of. I'll be using the coins (plastic ones sprayed gold, bought off Amazon a while back) as tokens to mark deteriorating cohesion levels during games. The treasure chest will be used to hold them until they are needed. In other news, my Seleucid cavalry have been posted on Curt's blog and have netted me 48 points to start off my Challenge campaign. Here's the linky thing. And the Seleucid cavalry are finished and submitted. As I can't post the pics of those until 24 hours after Curt posted them, but I can post some glamour pics of the finished nellies. These figures are 15mm from Donnington. 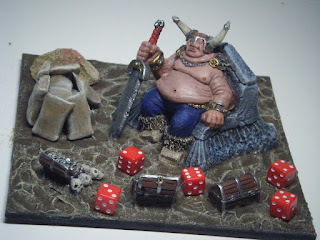 It seems from comments on yesterday's posts that I will be painting the Viking berserkers next. Well, all I can say to that is "Wird bin ful araed!". Well, things haven't been too good since I posted on Sunday. Monday was great up until the last few minutes of my journey home after a team meal, when I realised I needed to get to the toilet very quickly. I'm not sure if it was food poisoning or a bug that's doing the rounds but I was ill all night and all day yesterday. I was still rather dodgy today, but it seems to have eased off and I have managed to get a bit of work done on my current projects. My medieval camp scene for my Swiss army has been finished and pics have been mailed to Curt. However, he won't be posting them until Sunday evening, so I won't have any points until then unless I manage to finish my Seleucid cavalry. Speaking of which, they are very nearly done - just boots, hands, leatherwork and touch ups to do before I base them. I've also finished the nellies, but as they were started before the Challenge they won't count. I'm not sure which figures to do next. Should I do the coureurs de bois for BfC or my Viking berserkers? What do you guys reckon? last-minute order in and take advantage of the offers. a few more in the New Year. soon as they are ready they'll be posted on the store! that you think folks might be interested! Woohoo! Jon is back on the trail of extracting cash from the bank accounts of starship gamers! 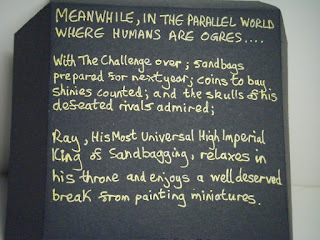 Yes, the early hours of this morning saw the kick-off of this year's Analogue Painting Challenge. However, I waited until this evening to start painting my first entries. I actually finished the first set, some medieval civilians for my Swiss camp base, alongside finishing off painting my Seleucid nelliephants and their crews. They've all had a coat of Klear/ink and later tonight I will remove them from their painting sticks. I've now started work on my Seleucid cavalry, painting the base colour for the horse flesh. Hopefully I'll get the Swiss camp finished tomorrow. 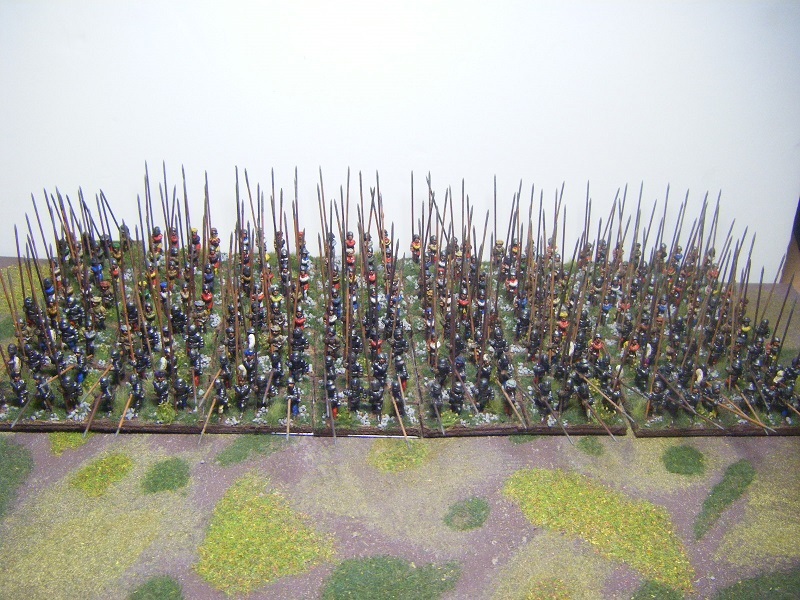 The Seleucid nellies won't get their basing done until I've finished the cavalry, so that they can be done together. I'll finish this post by wishing all my fellow Challengers the very best of luck in achieving their targets. I know, I know - that's rather a lot of ships. I'll be adding a few more next year, when I place an order using my 20% discount voucher. In front of the pipette boxes you can see the fighters. As they are so small I've drilled out the engine exhaust and mounted them on pins. the pins themselves have had the sharp points snipped off after being pushed through strips of vinyl floor tile. Time certainly seems to have flown by. 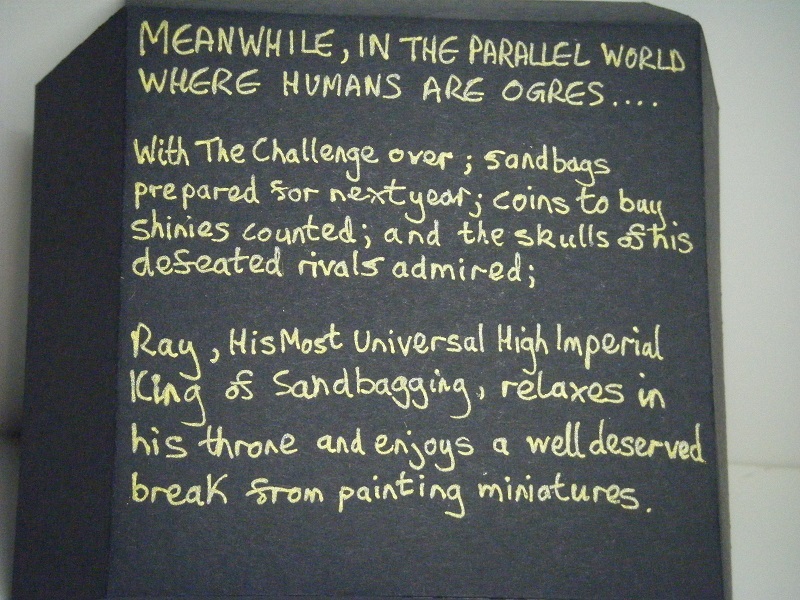 Tomorrow will see me begin work on my first entry for the Challenge. This will be some medieval civilians for my Swiss camp scene, which is handy as they will also count towards the first of the fortnightly bonuses. Alongside them, I'll be finishing work on the Seleucid elephants. With just a week and a bit until I head down to Sussex to spend Christmas with my family, my plan is to get some of the small projects done by then, leaving the huge projects until I get back to London. I'm not sure which will be first up from the multitude of projects I've got ready for the Challenge..